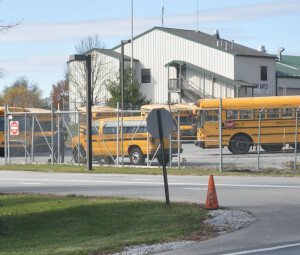 The Unionville-Chadds Ford School District bus depot in East Marlborough. If Monday’s Board of Education work session was any indication, the decision of whether to put the district’s bus services out to bid — and when — may prove highly contentious. More than two dozen bus drivers attended Monday night’s board work session meeting which also included some testy exchanges between board members. Superintendent of Schools Sharon Parker and members of administration guided the board through an executive summary of the 57-page report generated by Transportation Advisory Services (TAS) of Walworth, NY, which offered numerous options from increasing efficiencies in the current district-run operation to full-blown outsourcing of all district transportation. While there were discussions on varied topics from bus routing software to the general layout of the transportation building on Doe Run Road, there was clear friction between board director Paul Price and other members of the board. Price, who has championed outsourcing various school functions in order to save money, clashed with fellow director Jeff Hellrung and to a lesser extent with board president Timotha Trigg during the meeting. Price, who has decided not to run for re-election in 2011, issued a statement to those attending the meeting and directed people to a video he created and posted on You Tube, noting that the Unionville district pays more for busing than any other school district in the county than Octorara, based on a daily per-bus cost. The full text of Price’s statement appears here today as a Letter To The Editor. Following the meeting, Price suggested that Parker and the administration glossed over the outsourcing option and expressed frustration that the board will not get an opportunity to vote at its regular board meeting next week on whether to issue a Request For Proposal (RPF) to local bus companies. Price said he took great “umbrage” at Hellrung’s comments, saying they were clearly directed at him. Later, Trigg and Price were at odds over the numbers cited in the report, Trigg suggesting that she would like to see more data, and Price suggesting that the numbers in the report told the story. “I’m not looking for your analysis,” she said.